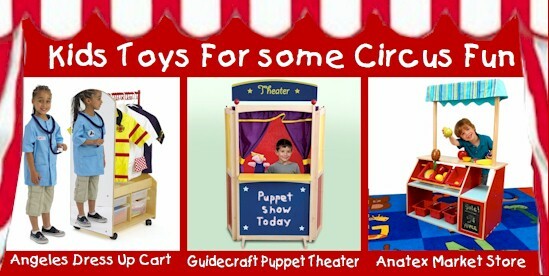 Most kids act like circus monkeys anyway, so why not give them their very own circus! All it takes is some fun colored paint and a few whimsical kids furniture items and toys and ta-da…the fun under the big top can begin! I came across this unique circus playroom picture and had to show it to everyone! I just love the way they painted the walls to make the room look like the inside of a circus tent. Then I thought…hmm, if they just added a couple of circus kids furniture pieces and circus related toys this room would be perfect. So I paired the circus theme playroom with the Stack a Buddies Storage Unit by Levels of Discovery that is full of circus fun! It includes three circus animal boxes that can be stacked on top of each other to create a cool storage unit. Not only will kids have a blast stacking these pieces, but they can keep all their juggling balls and magic tricks hidden inside. 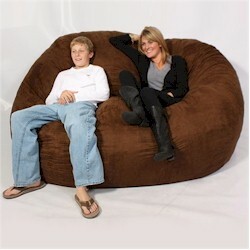 A circus wouldn’t be the same without an audience, so I added the Blue Sky Suede Fuf Bean Bag Chair which would make the perfect seat where mom or friends can sit and enjoy the show. Add more than one to really fill the Big Top! To really get your little ringmaster excited, I’d recommend filling this Circus Playroom with things like a Angeles Dress Up Cart Island stock full of circus outfits. This cart has a hanging rack and storage bins, plus a mirror, so it’s an all in one circus super star dressing room! A circus wouldn’t be the same without clowns and a clown show, so I’d recommend getting the GuideCraft Center Stage Floor Puppet Theater and some clown puppets. With this in the Big Top Playroom your kid is sure to keep you or friends entertained for hours! The last thing that every circus has to have is a concession stand, so consider adding the Market Store by Anatex, so your child can serve snacks and drinks to everyone before the show! 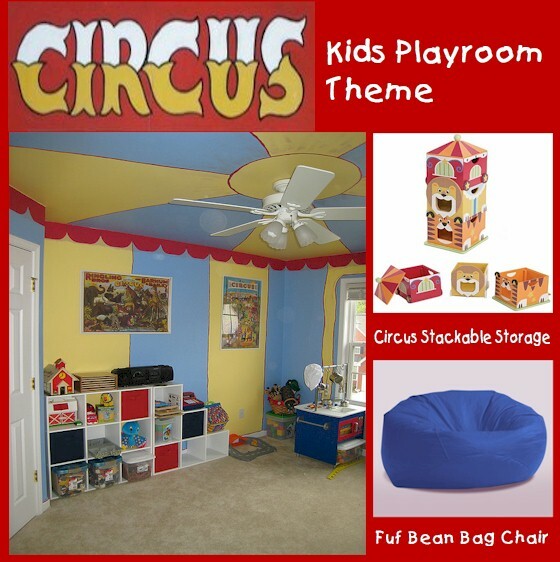 Ladies and Gentlemen and children of all ages…be prepared to witness the greatest show on earth if you create a Circus playroom in your home. Don’t’ be bummed out because your kid’s playroom is small. Make the most of that little room by choosing kids furniture that adds lots of comfort and fun to a space without creating a cramped environment. 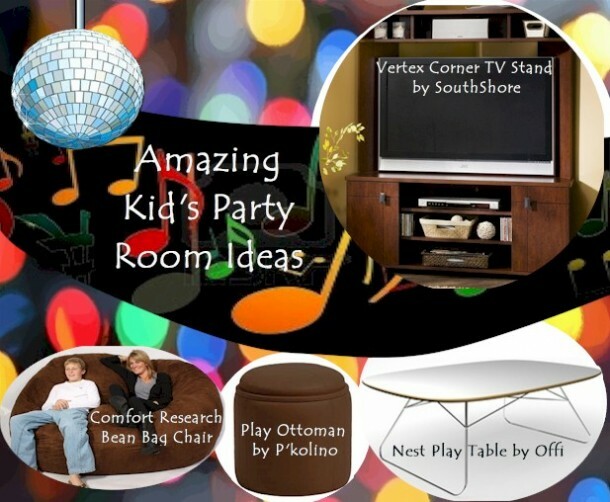 Lucky for you we have several items that will make your tiny playroom tremendously fun and organized! See some of our favorites below. There’s no doubt you will love the modern vibe and convenience that the Lea Nickelodeon Teen Nick Turntable Computer Desk will add to your child’s small playroom. There are so many reasons that this kids desk is the perfect choice for a small space. 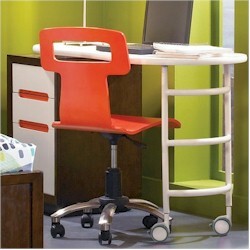 For one, the desk itself is smaller in size and is on casters, so it can be moved out of the way when not in use. It comes with a handy file cabinet that doesn’t take up much room, but offers your child enough space to keep supplies organized. This kids desk will become your kid’s favorite spot for doing homework, crafts, studying, surfing the web and tons more kid activities. 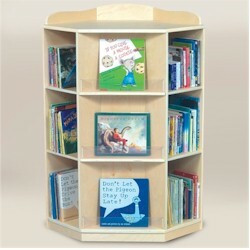 You will love the unique design of the Guidecraft Corner Book Nook. It’s perfect for small playrooms because it fits into a corner where you don’t usually put anything anyway. For a corner bookshelf it offers tons of room with the three outward-facing sections and six other sections with four adjustable shelves. Talk about maximizing your space! 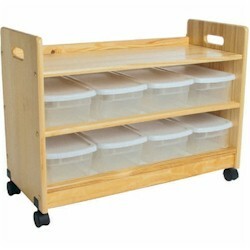 In a small space, cluttered toys can soon become a huge problem, but not if you get the Little Colorado Toy Organizer with Casters in Natural Lacquer. This top quality toy shelf comes with eight individual containers that will keep toys organized, plus an open shelf up top for toys your kids use most. This toy shelf is on casters, so it can be moved around the room when you need to rearrange the space for different types of play. Your kids are sure to clean up their messes with this handy toy storage shelf in the space. Kids don’t care where they sit, so instead of filling up the small space with bulky hairs, simply add the Fun Rugs Letters & Names Rug 39″ x 58″. This large rug is quite comfy, made of 100% nylon and big enough for a few kids to sit on and play together. It’s also water repellant and can be spot cleaned with ease, so it’s perfect for the playroom where kids tend to get a little wild and dirty. 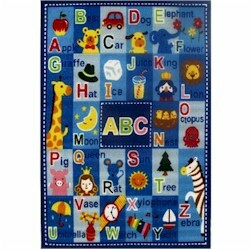 Also an educational tool, this rug introduces kids to letters, numbers and words. This rug is so inviting your kid might even take naps on it. 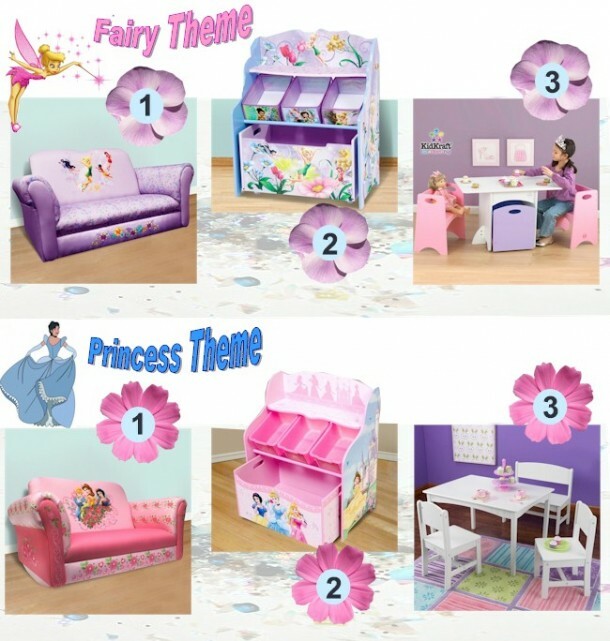 Stop by today at SimplyKidsFurniture to check out all of our kids furniture because we offer many more options for small playrooms besides the ones mentioned above.